A charming "flower fence" made of recycled plates can be found on S.E. 69th Avenue in the Kern Park neighborhood. 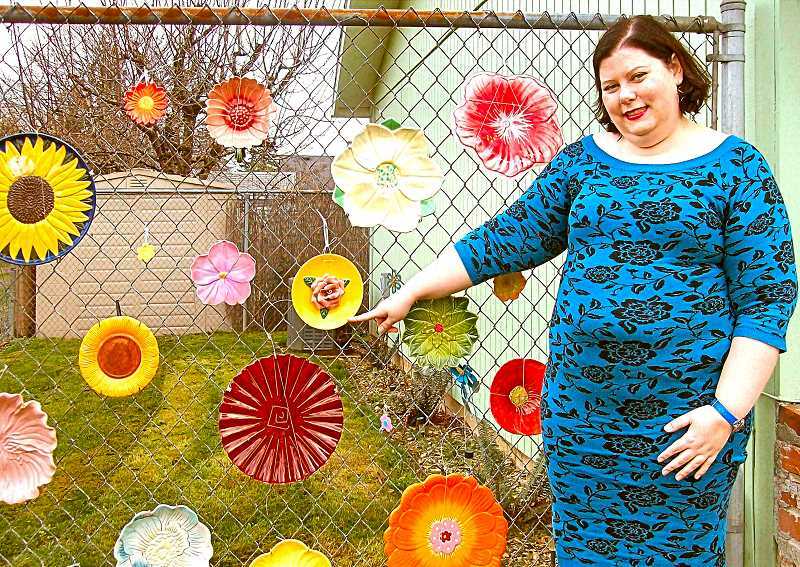 Woodmere School Teacher Samantha Breen installed some thirty ceramic "flower" plates along the fence of her home there. "The soil on that side of my house is too poor to grow the roses that I love," she says, "So, over the past four years, my mom and I have created an alternative type of garden. We add new plates when the old ones become damaged. I like the idea of reusing things, and this is an ideal way to do that." The colorful array of dinner-plate-size flowers ranges from images of roses and daisies to sunflowers. Breen and her mother purchase the flower plates at Goodwill and at garage sales. "I prefer using real flower images instead of abstract ones," says Breen. "I like the idea of a year-round flower garden, and the colors on my fence make me smile."